The enterprise strategy event in San Francisco hosted by Dell on Thursday was not just a coming out party for a new line of converged systems from the Texan titan, but also a coming out party for a new executive team responsible for enterprise products. That team includes top execs from Hewlett-Packard, Cisco Systems, and IBM and that has been infused by the acquisitions of Force10 Networks, EqualLogic, Compellent, AppAssure, Wyse, Quest Software, and a slew of other small but important companies that Michael Dell has shelled out billions to acquire. Having bought all of these and other companies, Dell now has to weave it together into a cohesive whole, and perhaps more importantly, come up with a coherent story to tell that will get enterprises that might otherwise go to its larger IT competitors, flush with more software and services, for products in an increasingly integrated and software-driven IT landscape. Hiring John Swainson, who ran IBM's middleware business as WebSphere was born and became a force and then CA Technologies as it was seeking to redeem itself, was the first step. In June, Dell was able to convince Don Ferguson, who was chief architect for IBM's Software Group and an IBM Fellow and who did stints at Microsoft and CA for a few years, to become CTO for Dell's Software Group. Getting an IBMer to leave is not an easy thing, but Dell has been very good at it, picking up David Johnson to run its acquisition strategy and we just learned this week, Jai Menon, who spent 25 years at IBM as a storage expert, became the CTO for its Systems and Technology Group, and also an IBM Fellow. As it turns out, Menon has been quietly working at Dell for the past ten weeks as its CTO for the Enterprise Solutions Group, essentially the same job he had at Big Blue. Menon's boss, who hosted the San Francisco event, is Marius Haas, who used to run HP's networking business before he was shown the door by ill-fated CEO Leo Apotheker and who was tapped to replace Brad Anderson (a former HPer as well) back at the end of August. Haas was joined by Dario Zamarian, a top Cisco exec who was tapped two years ago to run Dell's then fledgling networking business. Menon and Ferguson whiteboarded the Dell strategy, explaining more or less in plain American what the problems were that data centers were facing and how Dell might go about solving them. Machines like the new Active System 800, which was the reason why there was an event at all, are designed to be easier to buy, install, manage, and use – and better than the Exa alternatives from Oracle, the UCS alternatives from Cisco Systems, the CloudSystem and AppSystem alternatives from HP, and the PureFlex systems from IBM. "Customer pain points drive out architecture, we are differentiated on the hardware, and we are going to differentiate on the software," Menon explained after going over the issues. He also added that he had spent more time with Ferguson in the past five weeks while at Dell than he had with him in his prior career at IBM, just to illustrate how seriously Dell is taking hardware and software integration. Whether or not the Active Systems are better than the converged infrastructure alternatives from Dell's rivals remains to be seen. One key feature of the Active System machines – the memory caching technology that Dell got from its acquisition of RNA Networks in June 2011 and that company founder Michael Dell was hinting would be at the heart of a Dell Exadata Killer – is not going to be available until next year. Dell has been pretty vague about how it would use the RNA Networks software, which like ScaleMP's vSMP, allows for multiple server nodes to be linked into a kind of virtual SMP through standard network protocols. But it looks like RNA Networks code will be deployed to cluster server-side flash storage. "You can't just take any flash you might put in a storage array and put it into a server," explained Menon. You need to get the PCI-Express bus and related operating system drivers out of the way, piping data directly into main memory as fast as possible. 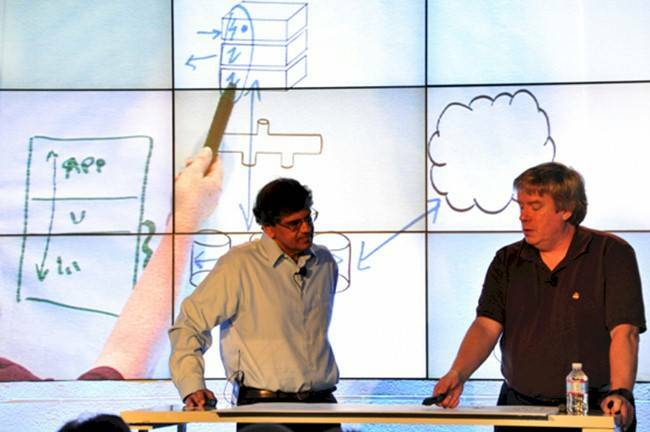 From the way Menon and Ferguson described the Active System in their whiteboarding session, it looks like Dell will use RNA Networks code to cluster and pool server-side flash, allowing it to be synchronized and pooled across multiple nodes and then snapshotted and replicated as a single unit instead of piecemeal, node by node. This way, the consistency of the data stored in fast flash near the CPUs and in disk drives inside the servers or in external arrays can be guaranteed as each is backed up to the appropriate medium for disaster recovery purposes. It also stands to reason that such a flash-based cluster using RNA Networks software will be very good at speeding up database accesses or web application servers that work in a parallel fashion across multiple nodes. Moreover, Dell has not fleshed out the Active Systems 800 machines with EqualLogic blade arrays, which launched in June and which will not ship inside the Active Systems until next year, according to Ben Tao, director of global product marketing for converged infrastructure systems at Dell. Dell has not detailed how rack-based machines, necessary for certain kinds of workloads where fatter memory (heavy virtualization or in-memory databases, for instance) or more disk drives (Hadoop is the biggie here) are requirements. Dell will get there. This is just the first in what will be a full family of systems. Exactly how it gets there has not been hammered out, and that will be part of what Menon and Ferguson will be working on in the coming months. The converged machine that was launched at the San Francisco event is called the Active System 800 machine. It's similar in concept to the vStart family of pre-packaged stacks, which include servers, storage, switches and systems software all tuned up to work together and with a single product number and a set price. In the vase of the vStarts, they came in T-shirt sizes describing the number of virtual machines each configuration could support. With the Active System machines, Dell is starting out with its M1000e blade chassis and most recent Xeon E5-based PowerEdge 12G M420 (quarter height), M620 (half-height), and M820 (full height) blade servers. Only machines that support 10 Gigabit Ethernet networking can be used in Active System setups. That is because Dell has split the difference between needing to put a whole switch (or set of switches) into the blade chassis (as IBM, HP, and Dell do now) or putting a relatively dumb fabric extender (as Cisco does in the UCS server nodes, be they B series blades or C series racks) by announcing a new device called the I/O Aggregator. The I/O Aggregator slides into the back of the M1000e chassis, just like switches and power supplies do, and comes with two QSFP+ ports that feed out to a top-of-rack switch that acts as an aggregation layer for a bunch of M1000e enclosures that are lashed together to comprise a cluster. You can add two more FlexIO plug-in modules to the I/O Aggregator, which can have two QSFP+ ports (which operate as four 10GE ports with cable splitters if you want), four SFP+ ports running at 10GE, or four 10GBASE-T ports also running at 10GE speeds. This device can aggregate as many as 32 ports coming off the server nodes (one for each node if you use the quarter-height M420 blades) into the chassis midplane, with only one 10GE mezzanine card coming off each server node, and you can have as many as six of these I/O Aggregator cards in each chassis to gang up capacity up to the top-of-rack switch. The I/O Aggregator can feed into any 10GE switch, so you can use a Cisco Nexus 5000 is you feel like it, but Dell would prefer that you use a Force10 Networks S4810. The way Dell envisions this device working is that the server geeks will have control of the I/O Aggregator in the chassis in terms of what nodes hook to what switch where (which they want), but the network configuration (spanning tree and so forth) and quality of service settings will be controlled from the top-of-racker. This presents a more clear delineation between servers and networks – which is funny in a converged system, but if you don't draw lines, you get finger pointing between server and network admins who blame each other when something goes wrong. At some point, El Reg expects Dell to tweak the I/O Aggregator so it can be used with PowerEdge rack servers, but Tao was quiet when asked about this. The Active System 800 comes with one or two M1000e enclosures and PowerEdge M620 servers with 128GB of memory and flash boot drives. You buy the M620s in bundles of eight until the two enclosures are full and you can switch to the other M420 or M820 servers if you want. You get redundant R620 rack servers to run the Active System Manager, a new management console that is based on the plug-in that Dell created for VMware's vCenter Server and that has been tweaked to provide full management of all the hardware assets in the cluster. This Active System Manager is itself a virtual machine that runs atop the ESXi hypervisor from VMware. The blades have Dell's iDRAC7 management controllers on them, and you can put from two to eight of Dell's EqualLogic PS6110, PS611-XV, or PS6510E arrays into the racks for storage for the blades. For networking, Dell is adding in two Force10 S4810 10GE switches in the preconfigured Active System 800, plus one Force10 S55 switch for out-of-band system management. You get two I/O Aggregators to start as well. On the software side, the Active System 800 configuration puts the ESXi 5.1 hypervisor on each node (which is free from VMware, but does not include a support contract) plus a trial license to vCenter 5.1. It also include the EqualLogic Host Integration Tools and SAN HeadQuarters software. You can buy Dell's OpenManage Essentials or VMware's vCloud Connector separately.